Continuing the successful Bible for Me series, Quiet Time introduces over twenty, simple, interactive devotionals for young children. Each devotional focuses on a basic theme, such as sharing or helping others, which is taught through a short scripture from the International Children's Bible, a toddler-sized explanation, and an engaging application. The chunky, padded board book format and 3-D animation-style art makes this a wonderful tool for helping young children to develop a daily pattern of spending time in their faith. 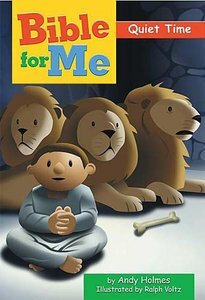 About "Quiet Time (Bible For Me Series)"
Created especially to capture the attention of preschoolers, THE BIBLE FOR ME presents some of the best-loved stories from the Old and New Testaments. It combines distinctive cartoon-style illustrations with lively narrative and sturdy construction.